Meha Jain is a PhD candidate in the Department of Ecology, Evolution, and Environmental Biology at Columbia University. Her current research examines the effects of short-term climate variability on agricultural production in northwest India, which will help better identify the possible impacts of future climate change in this region. 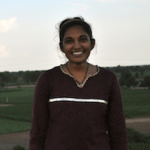 Specifically, her work uses remote sensing and structured household surveys to identify which farmers are best able to adapt cropping practices and are the least vulnerable to changing monsoon patterns.